Muscle Theory Official Apparel Unleash | Muscle Theory Fitness Factory Muscle Theory Unveil First OFFICIAL APPAREL! Good news Bros in the Factory! 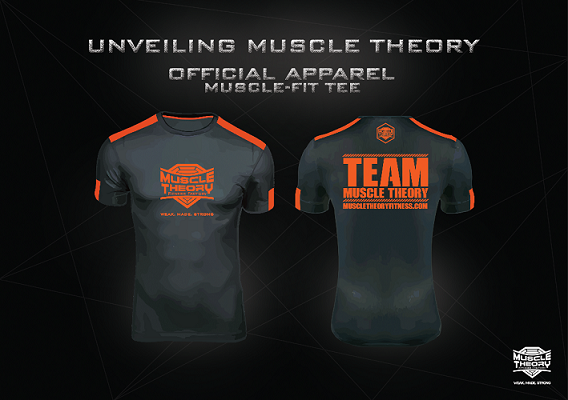 Muscle Theory Fitness Factory is set to unveil the FIRST Muscle Theory Official Apparel! The long-awaited ‘MUSCLE-FIT’ TEE is arriving soon! ‘One of the dilemma often encountered when it comes to training attires is that it often goes out of shape (and then it turned into your favourite pajamas/sleepwear) after several wash cycles!’. Worst still, it holds up the smell of your perspiration as you just can’t help but to always wear it to your gym. (Yeah, because that’s your FAVOURITEE shirt!). THE UNLEASH of our Premium Muscle-Fit Tee! Stay tuned.. More Gym Apparels in the pipeline!